"WE ARE AT THE DAWN OF A NEW ERA FOR MEDICINAL CANNABIS"
Nationwide in poll after poll over 70% of Americans agree that the use of cannabis when approved by a doctor for medical purposes, should be legal. We stand at the dawn of a new era for medicinal cannabis. We stand on the threshold of exciting cannabis-related treatments for many illnesses – Attention Deficit Disorder (ADD), Post-Traumatic Stress Disorder (PTSD), depression, Obsessive-Compulsive Disorder (OCD) – to name but a few. There is little or no debate regarding cannabis’ value as medicine. But the debate regarding cannabis has become more nuanced. If tincture of cannabis (e.g., the flowering tops of marijuana in alcohol) produced in a pharmaceutical lab is medicine, is smoked cannabis a medicine? If plants grown by GW Pharmaceuticals are medicine, are anyone else’s marijuana plants medicine? Are manufactured synthetic cannabinoids – cannabis chemicals -- better than extracts of the actual plant? The opponents of cannabis as medicine point to the 1938 Federal Food, Cosmetic and Drug Act which calls for all medication to be tested for usefulness and safety. They say that the cannabis plant is either untested or under tested. This argument raises the tangle of regulations and definitions concerning herbs, homeopathic remedies, nutritional supplements, over-the-counter medicine, and FDA approved prescriptions. The proponents of medicinal marijuana respond with several points. The first is that when the 1938 laws was passed, all medications on the market were "grandfathered" in. This means that any drugs in use before 1938 would not need to be tested. By definition, this exception to the law should include cannabis. They also point out that several University of California schools and GW Pharmaceuticals, among others, have done studies demonstrating cannabis’ medicinal usefulness for a variety of conditions. They claim that this work has gone forward despite the Food and Drug Administration (FDA)’s attempts to block cannabis research. Advocates of medical marijuana also remind us that in 1985 the FDA approved a synthetic THC medication, Marinol. This cannabinoid drug, is FDA approved and in use for nausea and appetite stimulation. Also, over 7,000 U.S. doctors in 3 states are known to have recommended smoked cannabis to their patients. All of these facts seem to indicate that it is only a short step to full government approval for medical marijuana; yet it has not happened. Battle lines are drawn over whether natural or synthetic chemicals found in marijuana are best suited for medicinal use. According to many government agencies, liquid extractions of cannabis or synthetic THC are medicine, but smoked cannabis plant is not. The conflict is well-demonstrated by conflicting statements from Dr. Andrea Barthwell, formerly of the Office of National Drug Control Policy (ONDCP). On the one hand, she has clearly stated that marijuana is not a medicine. On the other, she was hired by GW Pharmaceuticals to lobby the FDA to approve clinical trials for Sativex – a liquid medication made from the cannabis plant. She claims that “Sativex is not liquid marijuana.” This may seem odd since GW greenhouses are home to 10,000 cannabis plants. However, there is a legitimate difference between GW's plants and those grown by non-professionals. Cannabis grown in the wild or outdoors is not standardized. The marijuana used to make Sativex has been both clinically tested and it is carefully standardized. In other words, this makes Sativex medicine but not the marijuana in the backyard. The ambivalence of the government towards marijuana is only one problem. The other is the system by which medications are created: the pharmaceutical industry. Most drugs on the market today were created in laboratories by drug companies. The chemical formulas are patented by company that invented them. However, cannabis is a naturally growing plant. A pharmaceutical company cannot patent it. Since it costs millions to do studies, it may be that some companies have shied away from studying cannabis’ medical applications. It is possible to patent certain strains, extracts, synthetic or manufacturing processes. This could make products like Marinol (synthetic THC) and Sativex continue to be profitable. They cannot be produced by anyone but a drug company, so the companies can make money on them. 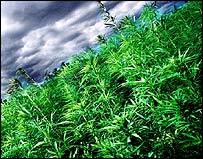 But it may be difficult for drug companies to compete with a plant that could grow like a weed in your back yard. It has been suggested that pharmaceutical companies have a stake in keeping smoked cannabis off the market. However, some believe that the future of medical marijuana lies in classical pharmacological drug development. There is great pharmaceutical industry interest in developing new drugs that can treat the constellation of symptoms for which cannabinoids might have therapeutic benefit. This fact might overcome their reluctance to invest in further research. Another issue raised by medical cannabis is the right of the individual versus the responsibility of the government to protect the public. On the one hand is the argument that people have a right to self-medicate with whatever they choose. Since cannabis has been widely recognized as a medicine, then a person should be able to use it as they would other medicinal herbs, such as vitamins, saw palmetto, milk thistle, chamomile, and other natural substances on the pharmacy shelves. These are not manufactured and have never been tested and been given FDA approval. They are plants used by humans and their ancestors for thousands of years. The question becomes, why should the government stand in their way? Why should cannabis be in a separate category from other herbal remedies? Dr. Steven Hosea, a Santa Barbara infectious disease doctor, has said “A physician’s mission is to heal illness, alleviate suffering, and provide comfort for the sick and dying.” And “medicinal marijuana is a medicine to which all deserve access.” After a 2006 medicinal cannabis conference Hosea noted that he was truly amazed by the science, the clinical studies and the testimonials by patients – many of whom had found no relief from using currently FDA approved therapies. In the 21st century we will see greater understanding of brain chemistry. We will see development of different strains of cannabis, perhaps with different enhanced properties. We will isolate different components of the plant. The future is bright for greater therapeutic applications of cannabis and cannabinoids. The battle over types of legal cannabis, who will develop them, and who will be able to access any of them will no doubt intensify in coming years. In this competition, we will see whether individuals or corporations prevail.